ISLAMABAD: The United States on Monday urged Pakistan to cooperate with it and “others” as it renewed its call for intensification of Pakistani operation in fight against terrorist groups allegedly operating from here. “Pakistan must redouble its efforts to confront militants and terrorists operating within the country,” US Defence Secretary James Mattis told Pakistani leaders, according to a statement issued by the US Embassy in Islamabad. Reminding his interlocutors of the potential benefits of cooperating with “US and others”, Mr Mattis said Pakistan could then contribute to peace and stability in Afghanistan and security of the region. The US defence secretary was in Islamabad on a day-long visit for what he described as ‘broadening the common ground’ and preventing terrorist organisations from finding safe havens here. This was Secretary Mattis’ first visit to Islamabad as the head of Pentagon. During his brief stay, he met Prime Minister Shahid Khaqan Abbasi and Chief of the Army Staff Gen Qamar Javed Bajwa. The talks with PM Abbasi were also attended by Defence Minister Khurram Dastagir, Foreign Minister Khawaja Asif, Interior Minister Ahsan Iqbal, National Security Adviser retired Lt Gen Nasser Janjua and Director General of Inter-Services Intelligence (ISI) Lt Gen Naveed Mukhtar. The embassy statement did not specify “others”, but it is presumed that it meant Afghanistan and India in particular. It needs to be recalled that the US had reacted strongly to the release of Jamaatud Dawa leader Hafiz Saeed from protective custody late last month. PM Abbasi denied the presence of terrorist sanctuaries on Pakistani soil and recalled the national resolve for eliminating terrorism in all forms and manifestations. Gen Bajwa in his meeting told Mr Mattis that “Pakistan has done much more than its share” and offered to “look into the possibility of miscreants exploiting Pakistan’s hospitality”. The US acknowledges the counterterrorism effort undertaken by Pakistani security forces, but say that it is focused against groups operating within the country, whereas those carrying out attacks outside the country’s borders have remained unaffected. Mr Mattis told PM Abbasi that the Trump administration desired “positive, consistent and long term relationship with Pakistan”. The prime minister agreed on the need for better cooperation between the two countries and called for a “broad based engagement”. President Trump’s policy for South Asia and Afghanistan, announced in August, had further strained Pak-US relations because Islamabad saw it as detrimental to its interests in the region. 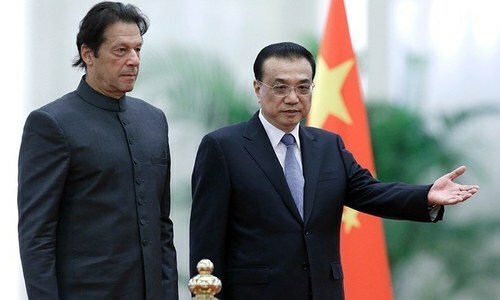 The two sides, however, later started a process of engagement to sort out the irritants in their ties, but despite high-level engagements have so far made little progress. Top Pakistani leaders admit that trust deficit continues to mar the relationship, whereas the American commander in Afghanistan says there is nothing to suggest that Pakistan has taken the steps it was expected to take to end what the Americans allege as militant presence on Pakistani soil. He had, however, in October warned that he would try “one more time” to work with Pakistan before going for “whatever steps are necessary” to end ‘safe havens’ here. 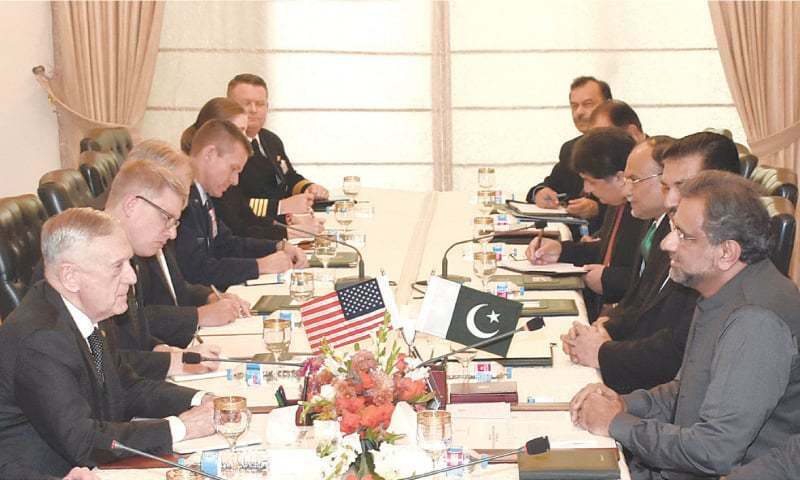 Pakistan and the US agreed to work towards “specific and sustained” actions on each other’s concerns, the Inter-Services Public Relations said and noted that the US defence secretary appeared to have understanding of Pakistan’s concerns. Anwar Iqbal adds from Washington: US Defence Secretary James Mattis told Pakistani leaders on Monday that their country can play a “vital role” in facilitating a peace process in Afghanistan and in bringing peace and stability to South Asia, the Pentagon said. In a statement to the media in Washington, Pentagon Chief Spokesperson Dana W. White said Secretary Mattis met PM Abbasi. “The Secretary emphasised the vital role that Pakistan can play in working with the United States and others to facilitate a peace process in Afghanistan that brings stability and security to the region,” Ms White said. The Pentagon also released the transcript of Secretary Mattis’ briefing to his media pool before he met the Pakistani leaders. As emphasised in the post-meeting statement, Secretary Mattis talked about Pakistan’s vital role in bringing peace to Afghanistan in this briefing as well. He also talked about common grounds between Pakistan and the United States in the fight against terrorism and acknowledged that Pakistan had lost thousands of troops and civilians in this war. “They have lost hundreds, thousands of their troops killed and wounded by terrorists. They have lost hundreds, thousands of their innocent people murdered and wounded by terrorists, so we know that there is common ground,” he said. Secretary Mattis also emphasised the need to expand this common ground without being combative with one another and referred to Gen Bajwa’s recent pledge to destroy all terrorist safe havens. “So, we will work together and we’ll find that common ground, if we have the will to. And then we’ll work on how we address the problems where we can work together,” he said. Secretary Mattis disagreed with a journalist who described US-Pakistan relationship as a 16-year-old story of failures. “I wouldn’t characterise everything over the past 16 years as failures,” he said. “Both Pakistan and Afghanistan, the Pakistan military, the Nato-led militaries of 39 nations have all been in fights here. We’ve got to find a way to work together,” he added. Secretary Mattis also stressed the need for better relations between India and Pakistan, adding all regional and international forces should work together to bringing stability and economic prosperity to South Asia. “Can you imagine a border between Pakistan and India where economic trade is not ongoing to the benefit of people on both sides of that border?” he asked. “We cannot only imagine it; it’s a reality right now. So, what we’ve got to do is all work together on this, and there’s a sense of urgency about that.